In the past three years three valued members and friends of the Principa Alliance have either died or had a serious stress-induced illness during or near tax season. A UK member died of a heart attack just after the beginning of the hectic January tax season. Another UK accountant had a stroke two days after tax season and a US member suffered a heart attack in the middle of tax season. This is not something I would ordinarily blog about but I think it’s important. We are always hearing about how practitioners “don’t have time” and yet we do. We all have all there is. Exactly 24 hours a day, every day of the year. It’s not the time we have that’s the limiting resource, it’s the choices we make about how we use it and that in turn determines both the frequency with which we expose ourselves to stressful situations and also how we respond. Animals in general, and humans in particular, have two primary goals in life: survival and procreation. To facilitate this our personal operating system (lets call it out brain) uses electro-chemical charges to drive behavior in response to different environmental stimuli. It’s only really in the past 10,000 years that “modern man” has been around – I define that as being from the time of agriculture started to become mainstream. That is not nearly enough time for any significant evolutionary development to take place so for all intents and purposes we have pretty much the same personal operating system now that our early ancestors had. But we have a totally different environment to the one in which our brain evolved. The stress-producing risks that prevailed hundreds of thousands of years ago simply do not exist today for the vast majority of humans. However, today’s risks are far more insidious and dangerous because in the old days, when we were exposed to the risk our cortisol peaked and when the risk went away, it quickly dropped back to normal. Today, on the other hand, that’s not what happens. Unless you manage yourself more effectively your cortisol levels remain high for extended periods of time and that’s what kills you! 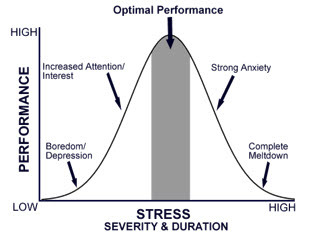 With that said, recent research has shown that a modest level of stress is actually a good thing from a performance viewpoint because it is associated with the creation of new brain cells that improve mental acuity but too much stress is very bad and leads to a higher probability of heart disease, obesity, depression as well as a degradation in your cognitive capability. This issue discussed in an article written by Travis Bradberry called How Successful People Stay Calm that ‘s definitely worth taking a look at. The article talks about ways to manage your emotions that in turn determines your stress level and therefore your health and performance. The importance of stress management to performance and your longevity and general health is extraordinarily well documented in Tony Schwartz’s book Be Excellent At Anything: The Four Keys to Transforming the Way we Work and Live.